What policies will power post-Brexit Britain? They say the only certainty in life is change – and within the myriad of discussions around Brexit and what might or might not happen, never a truer word has been spoken. We don’t know what post-Brexit Britain will look and feel like, but we do know it will be different. And that’s certainly the case when it comes to energy – supplies, costs, agreements and laws. We don’t know what will happen to any of them after March 31st next year (or more likely the subsequent two year transition period) but we have to keep asking the questions, raising relevant issues and flagging our concerns to anyone who will listen and has the power to influence outcomes. 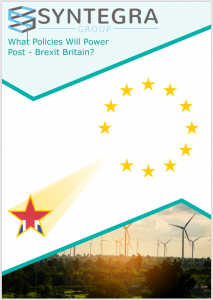 We’ve gone through a range of energy-related policies covered by the EU with the UK at its heart and sought expert views and commentary around how the Brexit ‘divorce’ might help or harm the UK’s energy sector, and in turn the British public’s purse. The EU is a key energy trading partner for the UK, supplying approximately 12% of the UK’s gas and 5% of electricity in 2016. The Internal Energy Market (IEM), the EU entity which allows for the unrestricted flow of power and gas between member states without tariffs. Nuclear power faces an uncertain future post-Brexit as the UK’s membership of Euratom, will lapse. Energy and environment policy might not be attracting all the Brexit headlines but it is essential for the successful functioning of the UK economy and the future of its low carbon transition. We were keen to offer a comprehensive overview of the policies and structures which might be impacted by Brexit as it’s such an integral part of the UK’s EU membership (and, therefore, departure). Whether we realise it or not, we are all affected in our day to day home and business lives by current EU energy policies which the UK helped to shape so it is in all our interests to monitor closely what the fall-out is from the final negotiations. If you would like to follow the post-Brexit British energy journey, start by downloading our guide here and look out for updates as and when clarity is forthcoming and final decisions are announced. Buckle up, it might be a long, bumpy and occasionally painful ride but hopefully we can reach our destination of a greener, more sustainably-focused UK intact – and sooner rather than later.